The Paraguayan Harp originates from Paraguay, in South America sandwiched between Brazil and Chile. The Paraguayan Harp is relatively new to the western harp world. It originates from Paraguay, a land locked country in South America sandwiched between Brazil Argentina and Chile. Most folk harp activity in Europe and America today has its origins in the revival of folk traditions during the mid 20th century. The Paraguayan harp has its origins in the old Spanish harps and European minstrel harps which had a straight round pillar. However its present design and construction date from the early/mid 20th century. Especially the unique divided neck, with the strings passing vertically between them and nylon/nylon wrapped strings for the bass notes.. This permits a light and strong harp with magnificent tone and volume. The technique for playing the Paraguayan Harp differs from most other folk harps. First the fingernails are normally used to pluck the strings similar to a classical guitar The fingers are held in a hooked fashion and a light plucking or squeezing is used The string tension is lower than many other harps allowing a light and relaxed style of playing. Some old welsh triple harp music is played this way also. There could have been some influence as there are villages in Paraguay where Welsh people have been living for over 100 years. My music is an expression of an inner energy, which seeks to express itself, both for my enjoyment and others as well. The great thing about harp music is its melodic beauty and its ability to provide a feeling of peace and beauty in the listener. People from Europe have been very appreciative of my music. The bass line is often rhythmic. A lot of my music uses Paraguayan elements as well as a lot of the ancient Celtic harp playing methods also, i.e. repeated notes, strong bass chords and using various modes. Also the close spacing of the strings allows very fast arpeggios wide chord reaching (easily 1½ octaves), fast scale like runs, and fluid tremolos. Originally I played the classical guitar. However, I was not a particularly successful guitarist. I first heard the Celtic harp on a record by Allan Stivell over 14 years ago. This music enchanted me. Eventually the desire to play the harp arose. I planned to obtain a Celtic harp as that was the only kind of folk harp I knew of..
As fate would have it, a friend told me of a harp-building workshop. They were building small Paraguayan harps. These were new to me, but I was immediately attracted to them as playing them wasn’t that much different to playing the guitar and I just loved the music being played on them. As time went by and my repertoire outgrew the small harp, the time came to build a bigger one. So plans were obtained from America and a full size Paraguayan harp was built. Also I started building harps for customers. These days I make Paraguayan and ancient Celtic harps. Both are decorated with a mixture of traditional and my original designs. 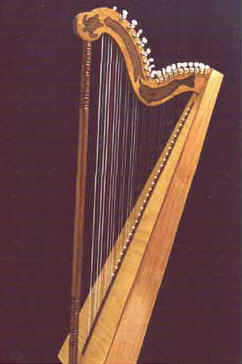 Paraguayan harps are lightweight, less than 6kgs for a 36-string model. The divided neck means there is no lateral force on the instrument. So the neck pillar and body are held together by the tension of the strings. The sound box is built with thin wood for the back and top 3-5 mm the sides may be thicker 6mm for rigidity and to increase sustain. 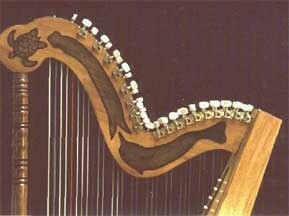 Various woods have been used each adding its own colour to the sound of the harp. 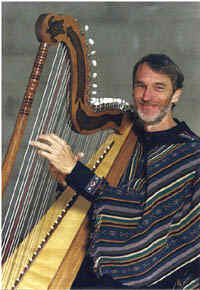 Despite the frail construction the harps are strong and are easy to carry around using the pillar as a handle. Also modern Paraguayan harps often use guitar machine heads to tune the strings These may offends traditionalists but they allow stable and precise tuning .In Australia, the split neck harp is very popular using machine heads even on Celtic harps. Because the neck and pillar of the Paraguayan Harp are not glued together it is possible to loosen the strings and pack the harp in a small box for shipping. This saves a fortune in freight costs because the freight companies charge by volume not weight. I have sent harps to Europe for moderate cost.